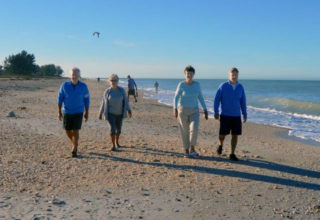 The Sarasota County Parks, Recreation and Natural Resources Department’s popular Sunrise Beach Walks will return to Siesta and Nokomis beaches starting Feb. 1, and they will continue every Wednesday through March 29, the department has announced. “These fun, energizing walks require a one-time registration fee of $5,” a news release notes. The payment covers an event T-shirt and a punch card. Participants may check in between 8 and 9:30 a.m. — before or after the minimum of a 1-mile, self-guided walk — to have their cards punched, the release adds. After a person complete four walks, he or she will receive a “goody bag” filled with items that encourage an active lifestyle, the release points out. “Complete eight walks, and you earn another incentive, all while enjoying Sarasota County’s world-class beaches,” the release adds. For more information call the Sarasota County Contact Center at 861-5000 or visit www.scgov.net.